This might be the weakest summer movie I have watched so far (although, it has to be noted that I have not watched Baywatch, which I heard is really quite bad), and yet there are still good stuffs & enjoyable moments in this film. To kick things off, the world itself is quite interesting. The part where they try to introduce us to this "Dark Universe" was quite good, and I feel like I want to know more about this universe. Unfortunately, it seems that because they focus a little too much on this, they sort of forsake the main story itself. 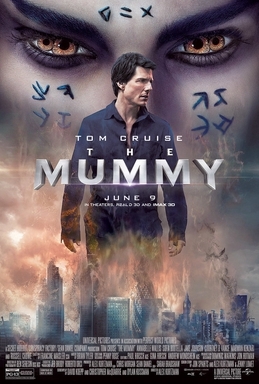 As a film of its own, The Mummy is a little too generic & shallow. The problems, unfortunately, also run a bit deeper than just the plot as a whole. Without spoiling anything, things will seem a little vague, but I need to say that there are a couple of scenes where the things that happen don't seem to quite make sense. There is no real clarity on what actually happened or where it came from, but it just did (and to the character's benefit, somehow). In movies, conveniences happen, but if the things that happen doesn't make sense and is not explained, it becomes annoying. Too vague? Yeah, sorry about that. Oh, and I also want to add that I have a similar feeling with the ending. I just wished there's a bit more clarity & explanation on the events that happened. But the movie has its positive aspects, though. The action sequences are quite good, and I enjoyed them. And Tom Cruise's character is quite likable (as he always is), and I liked the dynamic between his character and a few other characters (Chris Vail, Jenny). However, the plot still lacks the dramatic element. Meanwhile, the humour is a bit of hit-and-miss. The score/soundtrack is pretty good, but is not as memorable as other recent movies I've seen. Overall, there isn't really much to gush about this film. Nothing particularly stands out, and it is not quite a great film in any way. But the film isn't all that bad either, and can still be enjoyed. It was a fine start, but Universal will have to kick it up a notch if they want their Dark Universe to succeed.